San Luis Obispo water and sewer bills will increase next month and then will rise again in July 2017, continuing a multi-decade streak of increases. As of July 1, water rates will have increased for 12 straight years. Sewer rates will have increased for at least 23 consecutive years. In 2014, city staffers told CalCoastNews they are unaware the last year in which San Luis Obispo did not raise sewer rates, though they believe it was in the 1980s. Over the past 22 years, sewer rates have increased by an average of more than 7 percent annually. Water rates rose by an average 9.9 percent annually over the last 11 years. On Tuesday, the council voted 4-1 in separates votes to raise water and sewer rates. Councilman Dan Carpenter, who has at times objected to rate hikes, dissented on both votes. The average residential water bill is now slated to increase by about $10 a month, or 17.8 percent. The average monthly sewer bill will rise by $2.36, or 4.6 percent. Last year, city utilities manager Ron Munds said he expected water and sewer rates to rise by about 3 percent annually in the foreseeable future. 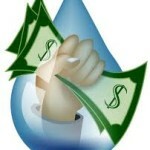 Currently, the average residential water bill is $56.41, Munds told CalCalCoastNews on Wednesday. The average water bill will increase to $66.47 beginning next month, and it will rise to $70.20 starting July 2016. The average residential sewer bill is currently $51.81. It will rise to $54.17 next month and to $55.77 in July 2016, Munds said. Combined water and sewer bills will increase from $108.22, the current cost for the average customer, to $120.64, starting next month, and to $125.97 beginning in July 2016. The current rate hike includes a drought surcharge that the city has added to both water and sewer rates. The surcharge is supposed to offset decreases in revenue stemming from customers using less water during the ongoing drought. The rate hike also includes an increase in the city’s base fee for water and sewer bills. The city changed its billing system two years ago and implemented a fixed charge that customers must pay no matter how much or little they consume. The base fee will rise from $5.28 to $7.63 next month and to $9.98 in July 2016. The initial drought surcharge will be 37 cents, and it will increase to 74 cents in July 2016. The latest rate hikes are in part due to the drought, during which customers have decreased both their water and sewer usage. Now, the city has a state mandate to cut its water usage by 12 percent. The city’s water fund is expected to complete the current fiscal year at a loss of $1 million. Utilities officials say they dipped into reserves in order to avoid raising rates in the middle of the fiscal year. But, the city is also dealing with lingering debt from the completed Nacimiento Pipeline project, as well as the sewage treatment plant upgrade that is scheduled to begin in 2016-2017. The city pays more than $6 million annually in Nacimiento Pipeline maintenance and debt service, and it has more than 20 years of payments remaining. San Luis Obispo is renovating its treatment plant in order to comply with regulatory demands from the state and regional water boards. The upgrade is estimated to cost $87.6 million, and the city plans to issue a $74 million bond to finance it, according to the sewer fund budget. Due to the plant upgrade, the debt service in the sewer fund will increase from $1.4 million to $6.2 million in 2016-2017. Critics of the city have also pointed to high staffing costs as reason for yearly rate hikes. Prior to voting on the 2013 rate hike, Carpenter said the council had failed to address high staffing costs, which in turn passed the expenses onto the ratepayers. Last year, the utilities department had a total of 61 full time employees. They were making an average base salary of $73,000, according to a payroll chart provided by the human resources department. Are these rates going up in order to pay the wage increases of the city manager and city attorney? Should be a law banning cities like slo from raising rates to make up for conservation. They should law off employees as there is less water to treat. Thank the overpaid city manager for this one. You people of slo are naive to think she is worth more than the governor of CA or even the VP of the U.S.
How do you all like they approved 300 new homes, with more on the way, while we’re in the middle of a drought? Are they capable of reasonable thought? What they are doing is totally unnecessary, and the way they’re doing it costs far more than good alternatives. Old Dave Romero had a scheme to pond treated sewage water on the ground, let it sink into the aquifer by which time it would be fully purified, then use windmills to pump it back out for adding to the city’s water supply. Instead of $87 million for the “upgrade,” this council could have bought Dalidio for$20 million and used it for Romero’s scheme. Why didn’t they? Because they like shiny stuff they can hire more people to run. It’s called empire building. They don’t care about residents’ pocketbooks, only about their empire.